While there’s different things to consider when evaluating used digital and film cameras, many of the basics are the same. Keep in mind that you should be extremely careful about purchasing a camera you can’t take a test shot with, and always at least ask for a warranty. As with any other major purchase, you ought to know the who, what , where, when, why, and how of your used camera transaction. The what of this equation is knowing what kind camera you’d like to buy. Are you looking for a digital camera, a film camera, a Polaroid? Do you want a Canon, a Fuji, or a Nikon? Do your research. There are many informative reviews on the internet that will help you get a clear picture on what camera will suit your needs. Answering why you’re considering a new-to-you camera could even help you decide what camera would be best for you. Are you a student looking for a tool for class? Are you shooting for fun? Are you looking for a high-end backup camera? If you’re looking for a Polaroid OneStep Classic Land Camera because it will look cool on your shelf, you don’t need it right away. You will find it when you find it, and it may be best to scour your area thrift stores—I have a friend who once found one for $2 and it took him a mere two hours to restore it to working order. 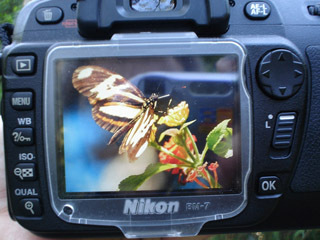 Nevertheless, if you need a Nikon D700 for a class that starts in three weeks, your when is a little bit different. It may be difficult to find a camera that you can inspect with your own (or a more experienced photographer’s) eyes in that time period depending on your location, but even if you find a killer deal online, proceed with caution. eBay is a great source for used camera equipment, but make sure you choose a seller with high rankings and an otherwise stellar reputation. Where else can you find cameras? There are many online forums—even Craigslist—that will allow you to meet the seller, and camera, before you agree to buy it. I’ve also found cameras at flea markets and thrift stores that work well for their price points, though this worked for me because I knew how to inspect them (more on this later). Wherever you find your camera, know who you are buying it from. Check their rankings online, strike up a conversation in person. Find out as much as you can about the camera’s previous life before you make it your own. Lastly, be clear on how you’ll be procuring the camera. Will it be arriving in the mail? Will you have time to check for damages? Or will you be testing it on a sunny day in a public park before cutting a check? The ideal way to inspect a camera is to put it up to your eye and shoot. If this isn’t possible because you’ve decided to buy your used camera online, feel free to ask for more pictures of the camera. A good listing will include the conditions—and plenty of close-up photos—of the lens optics and aperture, the electrical contacts and mounts, the focus ring, and the camera body. Make sure you have a warranty, and to follow the inspection steps once the camera arrives at your door. If you’re meeting up with the seller, choose a well-lit spot during the day so you can take some test photographs. Inspect the body of the camera first—does it look more used than the seller claimed? The best way to tell is to look for wear on the camera strap, in addition to large dents or scratches on the body. This may reveal that the camera has been dropped, which could cause internal damages. Examine the glass of the lens for dirt, dust, fungus, or scratches. It should be clean and clear when you look both at it and through it. Make sure there’s no damage to the lens mount—this could be a sign that the camera has been used carelessly, and will cease to operate with the lenses you need. Additionally, check for sturdiness. Does the camera feel solid in your hands? It shouldn’t squeak or feel fragile, and buttons and latches shouldn’t feel loose. This is where digital and film camera inspections begin to differ. If you’re buying a digital camera, you need to figure out how to check the sensor of the model you’re test driving. On a DSLR, the sensor captures the image you are shooting. Visually inspect the sensor for any signs of damage or dust. It ought to be in pristine condition, or else it will affect the quality of your photographs. A little bit of dust is to be expected, but if there’s a massive amount in the chamber or on the sensor, it will need to be cleaned. Use this information to negotiate a lower price. To check for any internal sensor issues, take a picture of a large, solid-colored object. Examine the photo at 100%. Any damage to the sensor will show up in the photo. You will also want to check for dead pixels, so bring your laptop. The best way I’ve discovered to do this is to shoot a photograph with the lens cap on. You’ll end up with a dark frame that you can study on your computer for dead spots. A few are normal, but if there are many that are noticeable, it’s likely that you’re having sensor issues. Just as with any camera, make sure that the viewfinder is not cracked and is dust-free, and be sure to do the same with the LCD screen—they’re expensive to replace! After going through these steps, have the previous owner pose for a photograph or two. This will allow you to see how the camera works, and will also give you a record of the buyer. 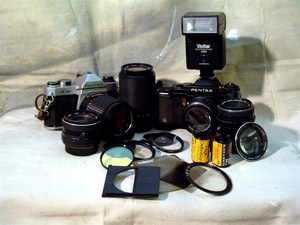 As for film cameras, it’s not unusual to buy many $2 cameras for parts. If you’re doing this, make sure you know what parts you need—and that you’re a confident camera hacker—before making sure every part of your purchase is pristine. When you visually inspect a film camera, make sure that it is free of mold and fungus. When a camera is neglected in a basement for years, these are not uncommon, but will damage your photographs. Open up the body and make sure that the shutter pops at all speeds. The back should easily open and close. The shutter advance should be smooth, and you should be able to change the shutter speed without getting the dial stuck. The aperture ring should move smoothly. Wear and tear is normal for a well-loved film camera, and if it has had a long life, it could very well remain in the realm of the cosmetic. Of course, if you don’t know what aperture or focus mean, bring a knowledgeable friend along to test the camera for you and teach you about the basics. DSLRs with an auto-focus function are simple to use, but if you’re looking for something simple, then you likely want it to last for a long time. Knowing what to look for can save you lots of money on your camera in addition to saving you the pain of having to replace it in another year. 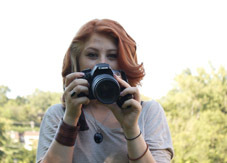 About the Author: Amy Cobb is a Jill-of-All-Trades media refugee turned blogger who, since jumping ship from the Fourth Estate, writes about all things media and media-education-related. When not pondering the benefits of a photography degree , Amy is doing her best not kill everything in her square foot garden plots, while always at the bidding of her Cavalier King Charles Spaniel, Snarls Barkley. Great post. Thanks. I’ve had great experiences with Adorama’s used department. In my opinion, they under rate their lenses. Both lenses I bought rated less than new but showed up super clean and practically new. Excellent advice. One additional thing to inspect with film cameras is the light seals which can be seen when the back is open. These seals are black foam strips in many cameras. Although the camera may appear to be pristine, these foam seals can disintegrate with age. Bad seals can be replaced, but their condition should be factored in to the price. I’ve bought used almost every piece of gear I currently own. And I’d like to add one thing to the list. Whether or not the original owner is a smoker. I’d seen “from a non-smoking home” in many adds on the Canon forum where I’ve bought all my used gear, and never thought much about it. That is until my current 7D arrived at my door. As soon as I opened the box, all I could smell was the stick of cigarette smoke. And for at least several months it almost made me want to puke every time I put the camera up to my face. Fortunately the camera was in excellent condition otherwise, and has performed flawlessly for almost 2 years now. You can be rest assured that for my next used purchase, especially a body that will be in such close proximity to my nose, I’ll be asking if the seller is a smoker.